Gluten-Free Living > Tips > What should I make for dinner this Meatless Monday? What should I make for dinner this Meatless Monday? 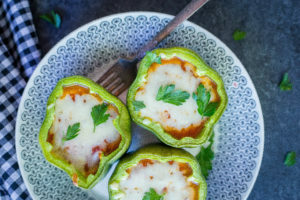 These vegetarian stuffed peppers contain all the delicious ingredients commonly found in lasagna—ricotta, mozzarella, garlic and marinara sauce.